Is Bluetooth on your Mac acting up recently? Are you loosing connection with a Bluetooth speaker randomly? Are you still able to pair Bluetooth devices to your Mac? 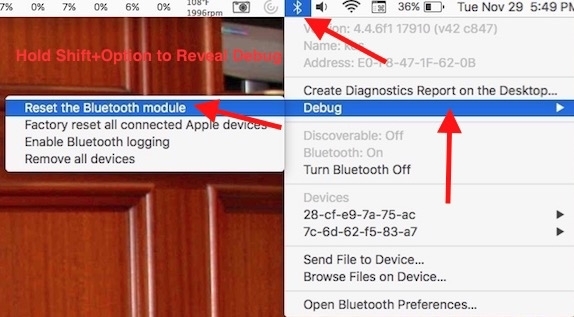 You can try to reset your Mac Bluetooth settings which is found in a secret debug menu. Follow the steps below. Note: Resetting the Bluetooth on Mac will not wipe your paired devices. 1. Ensure your Bluetooth Icon is showing in your menu bar. Go to System Preferences -> Bluetooth and ensure Show Bluetooth in menu bar is checked. 2. In your Menu Bar, Shift + Option click your Bluetooth icon. It will reveal several new options pictured below. 3. Choose Debug -> Reset the Bluetooth module. 4. You will receive a prompt asking you to continue, click ok.
Test your Bluetooth connections again.